When advised to consider full or partial denture tooth replacement, patients have many concerns including impact on their ability to chew and speak clearly and smile appearance. Advances in denture creation and materials makes them more comfortable and attractive than ever, and for patients with numerous missing teeth, they are an affordable, comfortable tooth replacement option. Once you’ve chosen to have a denture proper care is essential to retaining comfortable fit and extending the life of your denture. With thorough at home care and regular maintenance visits at Giamberardino Dental Care, denture wearers are able to enjoy comfort and stability like the day they received their dentures for years. You should still brush your teeth daily. Brush just as you would your natural teeth, but skip the toothpaste. Use a soft, denture toothbrush, and thoroughly cleanse your denture careful not to bend or warp your dental prosthetic. Rinse your denture and mouth with water after meals. This removes food particles and bacteria that may otherwise accumulate on your denture and between denture and gum wreaking havoc. Many patients damage their dentures during care by dropping them on countertops. Clean over a sink full of water or a towel to protect the denture in case it slips from your grip. Watch for rust on metal pieces. Some cleaners may cause this. Ask the Giamberardino Dental Care team to help you find a good cleaning product for your denture. When not wearing your denture, store it in water or cleaner so it doesn’t dry out or warp, but remember that soaking teeth in cleaner is not a substitute for thorough brushing every day. Remove your denture at night to allow gums to rest, and avoid gum disease that is more likely if dentures are worn overnight trapping bacteria on gums. Brush your gums with a soft bristled toothbrush, and rinse thoroughly with water to remove bacteria and plaque. Visit Giamberardino Dental Care every six months so our team can clean your denture, check fit, and make necessary adjustments. Fit related issues like rubbing, irritation, or slippage. 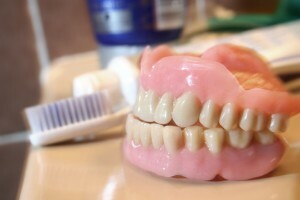 If your dentures don’t fit securely and comfortably, call our team right away. Infection can occur if dentures create sores in the mouth, and can lead to more severe health concerns. Thrush are sores caused by a natural yeast present in everyone’s mouth, but denture wearers are more susceptible to developing discomfort and sores than non-denture wearers. Gum and mouth irritation or allergy is probably the most common issue reported by denture wearers. At times, the discomfort is a matter of adjusting to the feeling of dentures, but in some cases, patients need allergy treatment or other care. Gum disease is the most common oral health issue in US adults, and denture wearers are at risk for this detrimental disease. Dry mouth is common among senior patients with dentures, and raises the risk for infection or gum disease as saliva serves as a natural neutralizing agent for bacteria. Most of these health concerns are easily treated by your dentist. If you’re experiencing discomfort, pain, redness, or swelling in your gums or soft tissue after receiving your denture, call our team right away. If you’re in need of dentures or are a new denture wearer who is struggling with the transition, the Giamberardino Dental Care team is here to help. Call to schedule a dentures consultation today. We can’t wait to help you fall in love with your dental prosthetic.